I am looking forward to the Brides & Babies Card Class at the Mason-Dixon library tonight! We will be making this cute dresser with the onesie hanging on it and the baby blanket peeking out of the drawer. Isn’t it so cute?! I think any new mom or mom-to-be would love receiving this fun card! Looks like one to be preserved in a scrapbook to me. Thank you for stopping by today. I’ll see some of you tonight in class! This is so sweet! A co-worker of mine is moving and I got to thinking that, minus the baby onesie, this would be a cute moving/house warming card 🙂 Looking forward to tonight’s class! This is a really cute idea. Love it. So adorable …. thanks so much for sharing and keep up the great work! OMG! This card is too cute! I love the idea! Thanks for sharing this card. Awesome! I especially love the quilt corner hanging out. Great touch! Love the dresser card ! Do you have instructions on how to make it? Let me know via my email . Thanks. Violeta. From: GA. I love this card. I am having a baby shower is there a way I can order these cards from you or if you can give me instructions on how to make it that would be great. Thanks a bunch! Hello, I saw this card on Pinterest and just loved it! I had to make a card for my niece’s baby shower and this was the PERFECT inspiration; thank you! Hi Becky- just saw your baby boy dresser card on Pinterest. So adorable!! Would/could you share the dimensions/ instructions to CASE it? Love the dresser card – would you care to share tutorial? 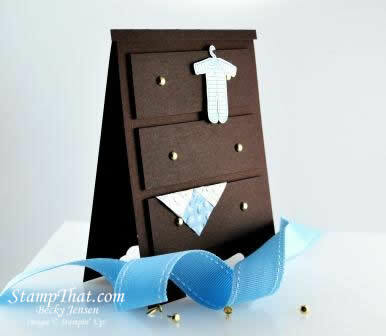 Love this New Baby Card with Dresser. Are you willing to share the directions? Ket me know asap, I have a shower next week. Thanks! I’m sorry, I do not have a tutorial for this card. Why would you share a card but not share the instructions? I try to share cards 6 out of 7 days a week, I’m afraid I do not have time to write instructions for each card I share. When I originally posted this project, I was advertising an upcoming class at which I was teaching how to make the card. After that time, I made many of these cards and sold them in my Etsy store.